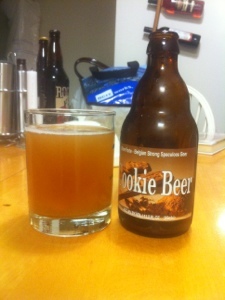 Cookie Beer is probably worth a try for the “huh?” factor and being able to say you have tried Cookie Beer, but this is likely not going to be many people’s favorite. As good looking beers go this is probably a 2 out of 10, an unfortunate cloudy brownish yellow with white head it lacks. Usual appeal. On the nose this beer is pleasant but boring, smelling mildly of grain and beer. The cookie element has yet to surface. Once this beer hits your lips the cookie-ness of it becomes apparent but not necessarily appealing. I spent several sips with a quizzical look on my face, I had no idea what to think of it. The beer is very sweet, tasting mostly of agave nectar, obviously trying to emulate cookie dough and failing. This is actually the opposite of a Belgian sour and is far too sweet for my tastes. The finish is nice, tasting closer to cookie than any other part of this beer. My honest opinion is that I dislike this beer. I do not dislike all sweet beers, the Jamaican Lager from Dockside Brewing comes to mind as a favorite. No, this beer simply tries too hard and falls short. Maybe if it were not advertised as beer, since it lacks any beer-specific qualities and could easily be some sort of vodka cooler Give it a try and see what you think but keep your expectations low. This entry was posted in Belgian Strong Ale.